Deutsche Bank AG (German pronunciation: [ˈdɔʏ̯t͡ʃə ˈbaŋk aːˈgeː] (listen)) is a German multinational investment bank and financial services company headquartered in Frankfurt, Germany. The bank is operational in 58 countries with a large presence in Europe, the Americas and Asia. As of April 2018, Deutsche Bank is the 15th largest bank in the world by total assets. As the largest German banking institution in the world, it is a component of the DAX stock market index. The company is a universal bank resting on three pillars – the Private & Commercial Bank, the Corporate & Investment Bank (CIB) and Asset Management (DWS). Its investment banking operations often command substantial deal flow and maintain different "sell side" and "buy side" departments. The object of the company is to transact banking business of all kinds, in particular to promote and facilitate trade relations between Germany, other European countries and overseas markets. Three of the founders were Georg Siemens, whose father's cousin had founded Siemens and Halske, Adelbert Delbrück and Ludwig Bamberger. Previous to the founding of Deutsche Bank, German importers and exporters were dependent upon British and French banking institutions in the world markets—a serious handicap in that German bills were almost unknown in international commerce, generally disliked and subject to a higher rate of discount than English or French bills. The bank's first domestic branches, inaugurated in 1871 and 1872, were opened in Bremen and Hamburg. Its first foray overseas came shortly afterwards, in Shanghai (1872) and London (1873) followed sometime by South America (1874–1886). The branch opening in London, after one failure and another partially successful attempt, was a prime necessity for the establishment of credit for the German trade in what was then the world's money centre. Major projects in the early years of the bank included the Northern Pacific Railroad in the US and the Baghdad Railway (1888). In Germany, the bank was instrumental in the financing of bond offerings of steel company Krupp (1879) and introduced the chemical company Bayer to the Berlin stock market. The second half of the 1890s saw the beginning of a new period of expansion at Deutsche Bank. The bank formed alliances with large regional banks, giving itself an entrée into Germany's main industrial regions. Joint ventures were symptomatic of the concentration then under way in the German banking industry. For Deutsche Bank, domestic branches of its own were still something of a rarity at the time; the Frankfurt branch dated from 1886 and the Munich branch from 1892, while further branches were established in Dresden and Leipzig in 1901. In addition, the bank rapidly perceived the value of specialist institutions for the promotion of foreign business. Gentle pressure from the Foreign Ministry played a part in the establishment of Deutsche Ueberseeische Bank in 1886 and the stake taken in the newly established Deutsch-Asiatische Bank three years later, but the success of those companies in showed that their existence made sound commercial sense. The immediate postwar period was a time of liquidations. Having already lost most of its foreign assets, Deutsche Bank was obliged to sell other holdings. A great deal of energy went into shoring up what had been achieved. But there was new business, too, some of which was to have an impact for a long time to come. The bank played a significant role in the establishment of the film production company, UFA, and the merger of Daimler and Benz. The bank merged with other local banks in 1929 to create Deutsche Bank und DiscontoGesellschaft, at that point the biggest ever merger in German banking history. Increasing costs were one reason for the merger. Another was the trend towards concentration throughout the industry in the 1920s. The merger came at just the right time to help counteract the emerging world economic and banking crisis. In 1937, the company name changed back to Deutsche Bank. The crisis was, in terms of its political impact, the most disastrous economic event of the century. The shortage of liquidity that paralyzed the banks was fuelled by a combination of short-term foreign debt and borrowers no longer able to pay their debts, while the inflexibility of the state exacerbated the situation. For German banks, the crisis in the industry was a watershed. A return to circumstances that might in some ways have been considered reminiscent of the "golden age" before World War I was ruled out for many years. After Adolf Hitler came to power, instituting the Third Reich, Deutsche Bank dismissed its three Jewish board members in 1933. In subsequent years, Deutsche Bank took part in the aryanization of Jewish-owned businesses; according to its own historians, the bank was involved in 363 such confiscations by November 1938. During the war, Deutsche Bank incorporated other banks that fell into German hands during the occupation of Eastern Europe. Deutsche Bank provided banking facilities for the Gestapo and loaned the funds used to build the Auschwitz camp and the nearby IG Farben facilities. During World War II, Deutsche Bank became responsible for managing the Bohemian Union Bank in Prague, with branches in the Protectorate and in Slovakia, the Bankverein in Yugoslavia (which has now been divided into two financial corporations, one in Serbia and one in Croatia), the Albert de Barry Bank in Amsterdam, the National Bank of Greece in Athens, the Creditanstalt-Bankverein in Austria and Hungary, the Deutsch-Bulgarische Kreditbank in Bulgaria, and Banca Comercială Română (The Romanian Commercial Bank) in Bucharest. It also maintained a branch in Istanbul, Turkey. In 1999, Deutsche Bank confirmed officially that it had been involved in Auschwitz. In December 1999 Deutsche, along with other major German companies, contributed to a US$5.2 billion compensation fund following lawsuits brought by Holocaust survivors. The history of Deutsche Bank during the Second World War has since been documented by independent historians commissioned by the Bank. Following Germany's defeat in World War II, the Allied authorities, in 1948, ordered Deutsche Bank's break-up into ten regional banks. These 10 regional banks were later consolidated into three major banks in 1952: Norddeutsche Bank AG; Süddeutsche Bank AG; and Rheinisch-Westfälische Bank AG. In 1957, these three banks merged to form Deutsche Bank AG with its headquarters in Frankfurt. In 1959, the bank entered retail banking by introducing small personal loans. In the 1970s, the bank pushed ahead with international expansion, opening new offices in new locations, such as Milan (1977), Moscow, London, Paris and Tokyo. In the 1980s, this continued when the bank paid U$603 million in 1986 to acquire Banca d'America e d'Italia. In 1989, the first steps towards creating a significant investment-banking presence were taken with the acquisition of Morgan, Grenfell & Co., a UK-based investment bank. By the mid-1990s, the buildup of a capital-markets operation had got under way with the arrival of a number of high-profile figures from major competitors. Ten years after the acquisition of Morgan Grenfell, the US firm Bankers Trust was added. Bankers Trust suffered major losses in the summer of 1998 due to the bank having a large position in Russian government bonds, but avoided financial collapse by being acquired by Deutsche Bank for $10 billion in November 1998. This made Deutsche Bank the fourth-largest money management firm in the world after UBS, Fidelity Investments, and the Japanese post office's life insurance fund. At the time, Deutsche Bank owned a 12% stake in DaimlerChrysler but United States banking laws prohibit banks from owning industrial companies, so Deutsche Bank received an exception to this prohibition through 1978 legislation from Congress. Deutsche continued to build up its presence in Italy with the acquisition in 1993 of Banca Popolare di Lecco from Banca Popolare di Novara for about $476 million. In 1999 it acquired a minority interest in Cassa di Risparmio di Asti. In October 2001, Deutsche Bank was listed on the New York Stock Exchange. This was the first NYSE listing after interruption due to 11 September attacks. The following year, Josef Ackermann became CEO of Deutsche Bank and served as CEO until 2012 when he became involved with the Bank of Cyprus. Then, beginning in 2002, Deutsche Bank strengthened its U.S. presence when it purchased Scudder Investments. Meanwhile, in Europe, Deutsche Bank increased its private-banking business by acquiring Rued Blass & Cie (2002) and the Russian investment bank United Financial Group (2005) founded by the United States banker Charles Ryan and the Russian official Boris Fyodorov which followed Anshu Jain's aggressive expansion to gain strong relationships with state partners in Russia. Jain persuaded Ryan to remain with Deutsche Bank at its new Russian offices and later, in April 2007, sent the President and Chairman of the Management Board of VTB Bank Andrey Kostin's son Andrey to Deutsche Bank's Moscow office. [a] Later, in 2008, to establish VTB Capital, numerous bankers from Deutsche Bank's Moscow office were hired by VTB Capital. In Germany, further acquisitions of Norisbank, Berliner Bank and Deutsche Postbank strengthened Deutsche Bank's retail offering in its home market. This series of acquisitions was closely aligned with the bank's strategy of bolt-on acquisitions in preference to so-called "transformational" mergers. These formed part of an overall growth strategy that also targeted a sustainable 25% return on equity, something the bank achieved in 2005. The company's headquarters, the Deutsche Bank Twin Towers building, was extensively renovated beginning in 2007. The renovation took approximately three years to complete. The renovated building was certified LEED Platinum and DGNB Gold. The bank developed, owned and operated the Cosmopolitan of Las Vegas, after the project's original developer defaulted on its borrowings. Deutsche Bank opened the casino in 2010 and ran it at a loss until its sale in May 2014. The bank's exposure at the time of sale was more than $4 billion, however it sold the property to Blackstone Group for $1.73 billion. Deutsche Bank was one of the major drivers of the collateralized debt obligation (CDO) market during the housing credit bubble from 2004 to 2008, creating about $32 billion worth. The 2011 US Senate Permanent Select Committee on Investigations report on Wall Street and the Financial Crisis analyzed Deutsche Bank as a case study of investment banking involvement in the mortgage bubble, CDO market, credit crunch, and recession. It concluded that even as the market was collapsing in 2007, and its top global CDO trader was deriding the CDO market and betting against some of the mortgage bonds in its CDOs, Deutsche bank continued to churn out bad CDO products to investors. The report focused on one CDO, Gemstone VII, made largely of mortgages from Long Beach, Fremont, and New Century, all notorious subprime lenders. 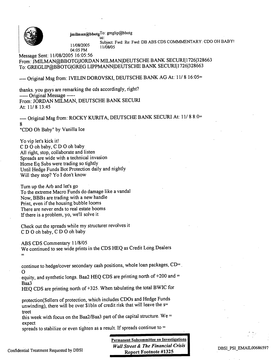 Deutsche Bank put risky assets into the CDO, like ACE 2006-HE1 M10, which its own traders thought was a bad bond. It also put in some mortgage bonds that its own mortgage department had created but could not sell, from the DBALT 2006 series. The CDO was then aggressively marketed as a good product, with most of it being described as having A level ratings. By 2009 the entire CDO was almost worthless and the investors (including Deutsche Bank itself) had lost most of their money. Greg Lippmann, head of global CDO trading, was betting against the CDO market, with approval of management, even as Deutsche was continuing to churn out product. He was a large character in Michael Lewis' book The Big Short, which detailed his efforts to find 'shorts' to buy Credit Default Swaps for the construction of Synthetic CDOs. He was one of the first traders to foresee the bubble in the CDO market as well as the tremendous potential that CDS offered in this. As portrayed in The Big Short, Lipmann in the middle of the CDO and MBS frenzy was orchestrating presentations to investors, demonstrating his bearish view of the market, offering them the idea to start buying CDS, especially to AIG in order to profit from the forthcoming collapse. As regards the Gemstone VII deal, even as Deutsche was creating and selling it to investors, Lippman emailed colleagues that it 'blew', and he called parts of it 'crap' and 'pigs' and advised some of his clients to bet against the mortgage securities it was made of. Lippman called the CDO market a 'ponzi scheme', but also tried to conceal some of his views from certain other parties because the bank was trying to sell the products he was calling 'crap'. Lippman's group made money off of these bets, even as Deutsche overall lost money on the CDO market. Deutsche was also involved with Magnetar Capital in creating its first Orion CDO. Deutsche had its own group of bad CDOs called START. It worked with Elliot Advisers on one of them; Elliot bet against the CDO even as Deutsche sold parts of the CDO to investors as good investments. Deutsche also worked with John Paulson, of the Goldman Sachs Abacus CDO controversy, to create some START CDOs. Deutsche lost money on START, as it did on Gemstone. On 3 January 2014 it was reported that Deutsche Bank would settle a lawsuit brought by US shareholders, who had accused the bank of bundling and selling bad real estate loans before the 2008 downturn. This settlement came subsequent and in addition to Deutsche's $1.93 billion settlement with the US Housing Finance Agency over similar litigation related to the sale of mortgage backed securities to Fannie Mae and Freddie Mac. Former employees including Eric Ben-Artzi and Matthew Simpson have claimed that during the crisis Deutsche failed to recognise up to $12bn of paper losses on their $130bn portfolio of leveraged super senior trades, although the bank rejects the claims. A company document of May 2009 described the trades as "the largest risk in the trading book", and the whistleblowers allege that had the bank accounted properly for its positions its capital would have fallen to the extent that it might have needed a government bailout. One of them claims that "If Lehman Brothers didn't have to mark its books for six months it might still be in business, and if Deutsche had marked its books it might have been in the same position as Lehman." Deutsche had become the biggest operator in this market, which were a form of credit derivative designed to behave like the most senior tranche of a CDO. Deutsche bought insurance against default by blue-chip companies from investors, mostly Canadian pension funds, who received a stream of insurance premiums as income in return for posting a small amount of collateral. The bank then sold protection to US investors via the CDX credit index, the spread between the two was tiny but was worth $270m over the 7 years of the trade. It was considered very unlikely that many blue chips would have problems at the same time, so Deutsche required collateral of just 10% of the contract value. The risk of Deutsche taking large losses if the collateral was wiped out in a crisis was called the gap option. Ben-Artzi claims that after modelling came up with "economically unfeasible" results, Deutsche accounted for the gap option first with a simple 15% "haircut" on the trades (described as inadequate by another employee in 2006) and then in 2008 by a $1–2bn reserve for the credit correlation desk designed to cover all risks, not just the gap option. In October 2008 they stopped modelling the gap option and just bought S&P put options to guard against further market disruption, but one of the whistleblowers has described this as an inappropriate hedge. A model from Ben-Artzi's previous job at Goldman Sachs suggested that the gap option was worth about 8% of the value of the trades, worth $10.4bn. Simpson claims that traders were not simply understating the gap option but actively mismarking the value of their trades. Deutsche Bank has a negligible exposure to Greece. Spain and Italy however account for a tenth of its European private and corporate banking business. According to the bank's own statistics the credit risks in these countries are about €18 billion (Italy) and €12 billion (Spain). For the 2008 financial year, Deutsche Bank reported its first annual loss in five decades, despite receiving billions of dollars from its insurance arrangements with AIG, including US$11.8 billion from funds provided by US taxpayers to bail out AIG. Based on a preliminary estimation from the European Banking Authority (EBA) in October 2011, Deutsche Bank AG needed to raise capital of about €1.2 billion (US$1.7 billion) as part of a required 9 percent core Tier 1 ratio after sovereign debt writedown starting in mid-2012. It needs to get its common equity tier-1 capital ratio up to 12.5% in 2018 to be marginally above the 12.25% required by regulators. As of September 2017 it stands at 11.9%. In January 2014, Deutsche Bank reported a €1.2 billion ($1.6 billion) pre-tax loss for the fourth quarter of 2013. This came after analysts had predicted a profit of nearly €600 million, according to FactSet estimates. Revenues slipped by 16% versus the prior year. Deutsche Bank's Capital Ratio Tier-1 (CET1) was reported in 2015 to be only 11.4%, lower than the 12% median CET1 ratio of Europe's 24 biggest publicly traded banks, so there would be no dividend for 2015 and 2016. Furthermore, 15,000 jobs were to be cut. In June 2015, the then co-CEOs, Jürgen Fitschen and Anshu Jain, both offered their resignations to the bank's supervisory board, which were accepted. Jain's resignation took effect in June 2015, but he provided consultancy to the bank until January 2016. Fitschen continued as joint CEO until May 2016. The appointment of John Cryan as joint CEO was announced, effective July 2016; he became sole CEO at the end of Fitschen's term. In January 2016, Deutsche Bank pre-announced a 2015 loss before income taxes of approximately €6.1 billion and a net loss of approximately €6.7 billion. Following this announcement, a bank analyst at Citi declared: "We believe a capital increase now looks inevitable and see an equity shortfall of up to €7 billion, on the basis that Deutsche may be forced to book another €3 billion to €4 billion of litigation charges in 2016." Since May 2017, its biggest shareholder is Chinese conglomerate HNA Group, which owns 10% of its shares. In November 2018, the bank had their Frankfurt offices raided by police in connection with ongoing investigations around the Panama papers and money laundering. Deutsche Bank released a statement confirming it would "cooperate closely with prosecutors". When Deutsche Bank was first organized in 1870 there was no CEO. Instead the board was represented by a speaker of the board. Beginning in February 2012 the bank has been led by two co-CEOs, and in July 2015 it announced it will be led by one CEO from 2016. The management bodies are the annual general meeting, supervisory board and management board. Deutsche Bank is one of the leading listed companies in German post-war history. Its shares are traded on the Frankfurt Stock Exchange and, since 2001, also on the New York Stock Exchange and are included in various indices, including the DAX and the Euro Stoxx 50. As the share had lost value since mid-2015 and market capitalization had shrunk to around EUR 18 billion, it temporarily withdrew from the Euro Stoxx 50 on August 8, 2016. With a 0.73% stake, it is currently the company with the lowest index weighting. In 2001, Deutsche Bank merged its mortgage banking business with that of Dresdner Bank and Commerzbank to form Eurohypo AG. In 2005, Deutsche Bank sold its stake in the joint company to Commerzbank. 3.05 % Paramount Services Holdings Ltd.
3.05 % Supreme Universal Holdings Ltd. The bank's business model rests on three pillars - the Corporate & Investment Bank (CIB), the Private & Commercial Bank and Asset Management (DWS). The Corporate & Investment Bank (CIB) is Deutsche Bank's capital markets business. The CIB comprises the below six units. Corporate Finance is responsible for advisory and mergers & acquisitions (M&A). Equities / Fixed Income & Currencies. These two units are responsible for sales and trading of securities. Global Capital Markets (GCM) is focused on financing and risk management solutions. It includes debt and equity issuances. Global Transaction Banking (GTB) caters for corporates and financial institutions by providing commercial banking products including cross-border payments, cash management, securities services and international trade finance. Deutsche Bank Research provides analysis of products, markets and trading strategies. Private & Commercial Clients Germany / International is the retail bank of Deutsche Bank. In Germany, it operates under two brands - Deutsche Bank and Postbank. Additionally, it has operations in Belgium, Italy, Spain and India. The businesses in Poland and Portugal are in the process of being sold. Wealth Management functions as the bank's private banking arm, serving high-net-worth individuals and families worldwide. The division has a presence in the world's private banking hotspots, including Switzerland, Luxembourg, the Channel Islands, the Caymans and Dubai. Deutsche Bank holds a majority stake in the listed asset manager DWS Group (formerly Deutsche Asset Management), which was separated from the bank in March 2018. In 1972, the bank created the world-known blue logo "Slash in a Square" – designed by Anton Stankowski and intended to represent growth within a risk-controlled framework. Deutsche Bank in general as well as specific employees have frequently figured in controversies and allegations of deceitful behavior or illegal transactions. As of 2016, the bank was involved in some 7,800 legal disputes and calculated €5.4 billion as litigation reserves, with a further €2.2 billion held against other contingent liabilities. Six former employees were accused of being involved in a major tax fraud deal with CO2 emission certificates, and most of them were subsequently convicted. It was estimated that the sum of money in the tax evasion scandal might have been as high as €850 million. Deutsche Bank itself was not convicted due to an absence of corporate liability laws in Germany. From as late as 2001 to at least 2007, the bank engaged in covert espionage on its critics. The bank has admitted to episodes of spying in 2001 and 2007 directed by its corporate security department, although characterizing them as "isolated". According to the Wall Street Journal's page one report, Deutsche Bank had prepared a list of names of 20 people who it wished investigated for criticism of the bank, including Michael Bohndorf (an activist investor in the bank) and Leo Kirch (a former media executive in litigation with bank). Also targeted was the Munich law firm of Bub Gauweiler & Partner, which represents Kirch. According to the Wall Street Journal, the bank's legal department was involved in the scheme along with its corporate security department. The bank has since hired Cleary Gottlieb Steen & Hamilton, a New York law firm, to investigate the incidents on its behalf. The Cleary firm has concluded its investigation and submitted its report, which however has not been made public. According to the Wall Street Journal, the Cleary firm uncovered a plan by which Deutsche Bank was to infiltrate the Bub Gauweiler firm by having a bank "mole" hired as an intern at the Bub Gauweiler firm. The plan was allegedly cancelled after the intern was hired but before she started work. Peter Gauweiler, a principal at the targeted law firm, was quoted as saying "I expect the appropriate authorities including state prosecutors and the bank's oversight agencies will conduct a full investigation." In May 2009, Deutsche Bank informed the public that the executive management had learned about possible violations which occurred in past years of the bank's internal procedures or legal requirements in connection with activities involving the bank's corporate security department. Deutsche Bank immediately retained the law firm Cleary Gottlieb Steen & Hamilton in Frankfurt to conduct an independent investigation and informed the German Federal Financial Supervisory Authority (BaFin). The principal findings by the law firm, published in July 2009, are as follows: Four incidents that raise legal issues such as data protection or privacy concerns have been identified. In all incidents, the activities arose out of certain mandates performed by external service providers on behalf of the Bank's Corporate Security Department. The incidents were isolated and no systemic misbehaviour has been found. And there is no indication that present members of the Management Board have been involved in any activity that raise legal issues or have had any knowledge of such activities. This has been confirmed by the Public Prosecutor's Office in Frankfurt in October 2009. Deutsche Bank has informed all persons affected by the aforementioned activities and expressed its sincere regrets. BaFin found deficiencies in operations within Deutsche Bank's security unit in Germany but found no systemic misconduct by the bank. The bank has initiated steps to strengthen controls for the mandating of external service providers by its Corporate Security Department and their activities. In 2013, the CEOs Anshu Jain and Jürgen Fitschen as well as the major shareholders of Deutsche Bank were awarded the Black Planet Award of the Foundation Ethics & Economics (Ethecon Foundation). On 23 April 2015, Deutsche Bank agreed to a combined US$2.5 billion in fines – a US$2.175 billion fine by American regulators, and a €227 million penalty by British authorities – for its involvement in the Libor scandal uncovered in June 2012. The company also pleaded guilty to wire fraud, acknowledging that at least 29 employees had engaged in illegal activity. It will be required to dismiss all employees who were involved with the fraudulent transactions. However, no individuals will be charged with criminal wrongdoing. In a Libor first, Deutsche Bank will be required to install an independent monitor. Commenting on the fine, Britain's Financial Conduct Authority director Georgina Philippou said "This case stands out for the seriousness and duration of the breaches ... One division at Deutsche Bank had a culture of generating profits without proper regard to the integrity of the market. This wasn't limited to a few individuals but, on certain desks, it appeared deeply ingrained." The fine represented a record for interest rate related cases, eclipsing a $1.5 billion Libor related fine to UBS, and the then-record $450 million fine assessed to Barclays earlier in the case. The size of the fine reflected the breadth of wrongdoing at Deutsche Bank, the bank's poor oversight of traders, and its failure to take action when it uncovered signs of abuse internally. In January 2017, Deutsche Bank agreed to a $7.2 billion settlement with the U.S. Department of Justice over its sale and pooling of toxic mortgage securities in the years leading up to the 2008 financial crisis. As part of the agreement, Deutsche Bank was required to pay a civil monetary penalty of $3.1 billion and provide $4.1 billion in consumer relief, such as loan forgiveness. At the time of the agreement, Deutsche Bank was still facing investigations into the alleged manipulation of foreign exchange rates, suspicious equities trades in Russia, as well as alleged violations of U.S. sanctions on Iran and other countries. Since 2012, Deutsche Bank had paid more than €12 billion for litigation, including a deal with U.S. mortgage-finance giants Fannie Mae and Freddie Mac. On 5 November 2015, Deutsche Bank was ordered to pay US$258 million (€237.2 million) in penalties imposed by the New York State Department of Financial Services and the United States Federal Reserve Bank after the bank was caught doing business with Burma, Libya, Sudan, Iran, and Syria which were under US sanctions at the time. According to the US federal authorities, Deutsche Bank handled 27,200 US dollar clearing transactions valued at more than US$10.86 billion (€9.98 billion) to help evade US sanctions between early 1999 until 2006 which are done on behalf of Iranian, Libyan, Syrian, Burmese, and Sudanese financial institutions and other entities subject to US sanctions, including entities on the Specially Designated Nationals by the Office of Foreign Assets Control. In response to the penalties, the bank will pay US$200 million (€184 million) to the NYDFS while the rest (US$58 million; €53.3 million) will go to the Federal Reserve. In addition to the payment, the bank will install an independent monitor, fire six employees who were involved in the incident, and ban three other employees from any work involving the bank's US-based operations. The bank is still under investigation by the US Justice Department and New York State Department of Financial Services into possible sanctions violations relating to the 2014–15 Ukrainian crisis and its activities within Russia. Environmentalists criticize Deutsche Bank for co-financing the controversial Dakota Access Pipeline, which is planned to run close to an Indian reservation and is seen as a threat to their livelihood by its inhabitants. Deutsche Bank has issued a statement addressing the critique received by various environmental groups. In January 2017, the bank was fined $425 million by the New York State Department of Financial Services (DFS) and £163 million by the UK Financial Conduct Authority regarding accusations of laundering $10 billion out of Russia. Deutsche Bank is widely recognized as being the largest creditor to real-estate-mogul-turned-politician Donald Trump, 45th President of the United States, holding more than US$360 million in outstanding loans to the candidate in the months prior to his 2016 election. As of December 2017 Deutsche Bank’s role in, and possible relevance to, Trump and Russian parties cooperating to elect him was reportedly under investigation by Robert Mueller of the FBI. As of March 2019, Deutsche Bank's relationship with Trump was reportedly also under investigation by two U.S. congressional committees and by the New York attorney general. In April 2019 House Democrats subpoenaed the Bank for Trump's personal and financial records. On 1 June 2018, the Australian Competition and Consumer Commission (ACCC) announced that criminal cartel charges were expected to be laid by the Commonwealth Director of Public Prosecutions (CDPP) against ANZ Bank, its Group Treasurer Rick Moscati, along with Deutsche Bank, Citigroup and a number of individuals. On 19 November 2018, a whistleblower on alleged money-laundering activities undertaken by Danske Bank stated that a large European bank was involved in helping Danske process $150 billion in suspect funds. Although the whistleblower, Howard Wilkinson, did not name Deutsche Bank directly, another inside source claimed the institute in question was Deutsche Bank's U.S. unit. On 20 July 2018, Deutsche Bank agreed to pay nearly $75 million to settle charges of improper handling of "pre-released" American Depositary Receipts (ADRs) under investigation of the U.S. Securities and Exchange Commission (SEC). Deutsche Bank didn't admit or deny the investigation findings but agreed to pay disgorgement of more than $44.4 million in ill-gotten gains plus $6.6 million in prejudgment interest and a penalty of $22.2 million. ^ Andrey Kostin (1979-2011), a Russian banker and son of Andrey Kostin who is the President and Chairman of the Management Board of VTB Bank, graduated from the Russian Government Finance Academy in 2000 and began working with Deutsche Bank's London office in 2000. From 2002-2007, the younger Andrey Kostin worked in Deutsche Bank's Office of Interbank and Corporate Sales in the countries of Central and Eastern Europe, the Middle East and Africa. In April 2007, Anshu Jain sent the younger Andrey Kostin to work at Deutsche Bank's Moscow office. While he was at Deutsche Bank's Moscow office, the Moscow office began posting profits of $500 million to $1 billion a year. He served on its management board beginning July 2008 and was the deputy chairman of the management board from February 2011. On July 2, 2011, at 7:30 a.m., while he was at a vacation retreat reserved for FSB personnel, he tragically died when his Can-Am Outlander-800 ATV crashed into a tree along a country road near Pereslavl-Zalessky and the village of Los (Russian: Лось) in the Yaroslavl region of Russia. He was not wearing a helmet. ^ Ewing, Jack (8 April 2018). "Deutsche Bank Replaces C.E.O. Amid Losses and Lack of Direction". The New York Times. Retrieved 8 April 2018. ^ Deutsche Bank. "Deutsche Bank Location Finder". Deutsche Bank. Retrieved 26 May 2018. ^ "Top 50 Largest Banks in the World". relbanks.com. 30 June 2017. Retrieved 26 May 2018. ^ For the history of Deutsche Bank in general see Lothar Gall (et al. ), The Deutsche Bank 1870–1995, London (Weidenfeld & Nicolson) 1995. ^ a b James, Harold. "Deutsche Bank Isn't Deutsch Anymore". Foreign Policy. Retrieved 20 November 2018. ^ Statut der Deutschen Bank Aktien-Gesellschaft, Berlin 1870, pp. 3–4. ^ a b James, H (13 September 2004). The Nazi Dictatorship and the Deutsche Bank. Cambridge University Press. ISBN 0521838746. Retrieved 11 July 2012. ^ a b One or more of the preceding sentences incorporates text from a publication now in the public domain: Rines, George Edwin, ed. (1920). "Deutsche Bank, The" . Encyclopedia Americana. ^ Manfred Pohl / Angelika Raab-Rebentisch, Die Deutsche Bank in Bremen 1871–1996, Munich, Zurich (Piper) 1996. ^ Manfred Pohl / Angelika Raab-Rebentisch, Die Deutsche Bank in Hamburg 1872–1997, Munich, Zurich (Piper) 1997. ^ Deutsche Bank in China, Munich (Piper) 2008. ^ Manfred Pohl / Kathleen Burk, Deutsche Bank in London 1873–1998, Munich, Zurich (Piper) 1998. ^ Christopher Kobrak, Banking on Global Markets. Deutsche Bank and the United States, 1870 to the Present, New York (Cambridge University Press) 2008. ^ A Century of Deutsche Bank in Turkey, Istanbul 2008, pp. 21–27. ^ Historische Gesellschaft der Deutschen Bank (ed. ), Die Deutsche Bank in Frankfurt am Main, Munich, Zurich (Piper) 2005. ^ Manfred Pohl / Angelika Raab-Rebentisch, Die Deutsche Bank in Leipzig 1901–2001, Munich, Zurich (Piper) 2001. ^ Manfred Pohl, Deutsche Bank Buenos Aires 1887–1987, Mainz (v. Hase & Koehler) 1987. ^ Maximilian Müller-Jabusch, 50 Jahre Deutsch-Asiatische Bank 1890–1939, Berlin 1940. ^ a b Schmid, John (5 February 1999). "Deutsche Bank Linked To Auschwitz Funding". The New York Times. Retrieved 28 January 2010. ^ "$5.2 Billion German Settlement". Web.archive.org. 15 December 2004. Archived from the original on 8 September 2006. Retrieved 17 August 2011. ^ For a detailed account of Deutsche Bank's involvement with the Nazis see: Harold James. The Nazi Dictatorship and the Deutsche Bank. Cambridge University Press, 2004, 296 pp., ISBN 0-521-83874-6. ^ "La bella banca" (PDF). Bankgeschichte.de. February 2018. ^ Moyer, Liz (30 October 2007). "Super-Size That Severance". Forbes. Retrieved 12 December 2018. ^ a b c Andrews, Edmund L. (1 December 1998). "Bank Giant: The Overview; Deutsche Gets Bankers Trust for $10 Billion". The New York Times. Retrieved 12 December 2018. ^ Brinded, Lianna (11 November 2014). "Bank of Cyprus Funded and Controlled by Ex-KGB, Billionaires and Controversial Former Financiers". International Business Times UK. Archived from the original on 12 August 2015. Retrieved 17 December 2018. ^ a b Protess, Ben; Silver-Greenberg, Jessica; Drucker, Jesse (19 July 2017). "Big German Bank, Key to Trump's Finances, Faces New Scrutiny". New York Times. Archived from the original on 20 July 2017. Retrieved 17 December 2018. ^ a b c d Harding, Luke (21 December 2017). "Is Donald Trump's Dark Russian Secret Hiding in Deutsche Bank's Vaults?". Newsweek. Archived from the original on 9 November 2018. Retrieved 17 December 2018. ^ Sampathkumar, Mythili (14 April 2017). "Former MI6 chief Richard Dearlove says Donald Trump borrowed money from Russia during 2008 financial crisis: Days before taking office, Mr Trump said Russia had never had any 'levarage' over him". The Independent. Archived from the original on 14 December 2018. Retrieved 17 December 2018. ^ a b c d e f g "Сын главы ВТБ Андрей Костин разбился на квадроцикле: 32-летний банкир погиб на отдыхе в Ярославской области" [The son of the head of VTB Andrei Kostin crashed on a quad: 32-year-old banker died on holiday in the Yaroslavl region]. Izvestia (in Russian). 2 July 2011. Archived from the original on 17 July 2018. Retrieved 17 December 2018. ^ Шипилов, Евгений; Танас, Ольга (4 July 2011). "Погиб на трезвую голову: В ДТП погиб сын президента ВТБ Андрей Костин" [Killed sober: The accident killed the son of the president of VTB Andrei Kostin]. Gazeta (in Russian). Archived from the original on 18 October 2018. Retrieved 17 December 2018. ^ Corcoran, Jason (22 December 2011). "Putin Pushing Russian Banks Points 'Two Tanks' at Western Firms". Bloomberg Businessweek. London. ^ Rapoza, Kenneth (12 October 2011). "Russian Bank Heads To New York". Forbes. New York City. Archived from the original on 15 October 2011. Retrieved 17 December 2018. ^ "Unprofitable Vegas casino sold by Deutsche Bank for $1.73 billion". The Las Vegas News.Net. Archived from the original on 17 May 2014. Retrieved 17 May 2014. ^ a b c d "Levin–Coburn report on Wall Street and the Financial Crisis" (PDF). US Senate Permanent Subcommittee on Investigations. 13 April 2011. Archived from the original (PDF) on 5 May 2011. ^ "Deutsche Bank Settles with US Shareholders". Market Watch. 3 January 2014. ^ a b Braithwaite, Tom; Scannell, Kara; Mackenzie, Michael (5 December 2012). "Deutsche hid up to $12bn losses, say staff". Financial Times. ^ a b c d e f g h i Braithwaite, Tom; Mackenzie, Michael; Scannell, Kara (5 December 2012). "Deutsche Bank: Show of strength or a fiction?". Financial Times. ^ Javers, Eamon (15 March 2009). "AIG ships billions in bailout abroad". politico.com. Retrieved 27 January 2010. ^ "Deutsche Bank Said to Be Ordered by EU to Close $1.7 Billion Capital Gap". Bloomberg. 28 October 2011. ^ "Deutsche Bank reports core capital ratio of 11.9% despite 2016 full year net loss of EUR 1.4 billion – Newsroom". www.db.com. ^ "When Deutsche Bank sneaks out its results on a Sunday night, they can't be good". Quartz. 19 January 2014. ^ "Deutsche Bank Plans to Eliminate Dividend for Two Years in Overhaul". 29 October 2015. ^ "Deutsche Bank cutting 15,000 jobs as new CEO sets out strategy plan". 29 October 2015. ^ "Deutsche Bank appoints John Cryan to succeed Jürgen Fitschen and Anshu Jain". Deutsche Bank. Archived from the original on 22 June 2015. Retrieved 7 June 2015. ^ "Jain Era Ending as Deutsche Bank Appoints Cryan for Top Job". Bloomberg. Retrieved 28 March 2017. ^ "Deutsche Bank reports preliminary full year and fourth quarter 2015 results". ^ a b "Can Cryan halt Deutsche Bank's decline?". Euromoney. March 2016. ^ "HNA Group, Secretive Chinese Conglomerate, Takes Top Stake in Deutsche Bank". The New York Times. 3 May 2017. ^ Harding, Luke (29 November 2018). "Deutsche Bank offices raided in connection with Panama Papers". The Guardian. Retrieved 29 November 2018. ^ "AUTO1 Fintech". Crunchbase. Retrieved 13 March 2019. ^ "Deutshche Bank Annual Report". Retrieved 19 November 2015. ^ "Neue Führung: Christian Sewing wird Chef der Deutschen Bank". Spiegel Online. 8 April 2018. Retrieved 9 April 2018. ^ a b Bray, Chad (19 May 2016). "Jürgen Fitschen to Stay With Deutsche Bank in New Role". The New York Times. ISSN 0362-4331. Retrieved 8 April 2018. ^ Dakers, Marion (2017). "Former Deutsche Bank boss Anshu Jain takes up new role at Cantor Fitzgerald". The Telegraph. ISSN 0307-1235. Retrieved 8 April 2018. ^ Germany, Süddeutsche de GmbH, Munich. "Der Außenminister, der Kanzler-Neffe und Mr. Peanuts". Süddeutsche.de (in German). Retrieved 8 April 2018. ^ "Banken: Chronologie: Vorstandssprecher der Deutschen Bank". Die Zeit (in German). 31 May 2012. ISSN 0044-2070. Retrieved 8 April 2018. ^ "Deutsche Bank fliegt aus Stoxx Europe 50". manager magazin (in German). Retrieved 4 March 2019. ^ "EURO STOXX 50® INDEX" (PDF). www.stoxx.com. Retrieved 4 March 2019. ^ "Annual Report 2006 / Related Party Transactions". annualreport.deutsche-bank.com. 26 March 2007. Retrieved 4 March 2019. ^ "Shareholder Structure – Deutsche Bank". www.db.com. Retrieved 4 March 2019. ^ "Deutsche Bank Corporate & Investment Bank". db.com. Retrieved 29 April 2018. ^ "Deutsche Bank sells chunk of Polish business to Santander". Financial Times. 14 December 2017. Retrieved 29 April 2018. ^ "Deutsche Bank To Sell Portuguese Private and Commercial Clients Business To Abanca". Reuters. 27 March 2018. Retrieved 29 April 2018. ^ The Financial (28 May 2018). "Germany's biggest Private & Commercial Bank is launched". www.finchannel.com. Retrieved 29 May 2018. ^ "Wealth Management - Locations". Deutsche Bank. Retrieved 29 April 2018. ^ "Deutsche Bank Logo: Design and History". Retrieved 18 August 2011. ^ "Deutsche Bank: Neuer Skandal | Börse Aktuell". Boerse.ARD.de. Archived from the original on 4 April 2017. Retrieved 28 March 2017. ^ "Steuerbetrug: Sechs Ex-Mitarbeiter der Deutschen Bank verurteilt". Die Zeit. Retrieved 28 March 2017. ^ a b c d e f Crawford, David; Karnitschnig, Matthew (3 August 2009). "Bank Spy Scandal Widens". The Wall Street Journal. Retrieved 27 January 2010. ^ "Deutsche Bank undertakes independent investigation" (Press release). duetsche-bank.de. 22 May 2009. Archived from the original on 1 June 2010. Retrieved 28 January 2010. ^ a b c "Deutsche Bank gives update on inquiries" (Press release). deutsche-bank.de. 22 July 2009. Archived from the original on 1 June 2010. Retrieved 27 January 2010. ^ "Press release Public Prosecutor's Office in Frankfurt" (Press release). sta-frankfurt.justiz.hessen.de. 8 October 2009. Retrieved 14 October 2010. ^ "Deutsche Bank Probe Finds Individual Misconduct". The Wall Street Journal. 18 December 2009. Retrieved 14 October 2010. ^ "Ethics & Economics – Black Planet Dossier 2013 DEUTSCHE BANK". www.ethecon.org. Retrieved 5 March 2019. ^ "Deutsche Bank receives Black Planet Award at AGM". Banktrack. Retrieved 5 March 2019. ^ a b c "Deutsche Bank fined record $2.5 billion in rate rigging inquiry". Reuters. 23 April 2015. Retrieved 23 April 2015. ^ a b c Protess, Ben; Jack Ewing (23 April 2015). "Deutsche Bank to Pay $2.5 Billion Fine to Settle Rate-Rigging Case". The New York Times. Retrieved 23 April 2015. ^ Freifeld, Karen. "Deutsche Bank agrees to $7.2 billion mortgage settlement with U.S." Reuters. Retrieved 13 January 2017. ^ "Deutsche Bank to pay US$258m for violating US sanctions". Channel NewsAsia. Archived from the original on 6 January 2016. Retrieved 5 November 2015. ^ "NYDFS Announces Deutsche Bank to Pay $258 Million, Install Independent Monitor, Terminate Employees for Transactions on Behalf of Iran, Syria, Sudan, Other Sanctioned Entities". New York State Department of Financial Services. Archived from the original on 7 November 2015. Retrieved 5 November 2015. ^ "Deutsche Bank fined $258m for violating US sanctions". The Guardian. Agence France-Presse. Retrieved 5 November 2015. ^ "Deutsche Bank ordered to pay US over $250mn for violating sanction regime". RT. Retrieved 5 November 2015. ^ Tabuchi, Hiroko (7 November 2016). "Environmentalists Target Bankers Behind Pipeline". The New York Times. ISSN 0362-4331. Retrieved 5 March 2019. ^ Network, Action. "Call on Deutsche Bank to Divest from DAPL". actionnetwork.org. Retrieved 5 March 2019. ^ "Preservation of sensitive, protected sites". www.db.com. Retrieved 5 March 2019. ^ "DFS Fines Deutsche Bank $425 Million for Russian Mirror-Trading Scheme". Dfs.ny.gov. 30 January 2017. Retrieved 28 March 2017. ^ Jill Treanor. "Deutsche Bank fined $630m over Russia money laundering claims | Business". The Guardian. Retrieved 28 March 2017. ^ Jr, Landon Thomas (30 January 2017). "Deutsche Bank Fined for Helping Russians Launder $10 Billion". The New York Times. Retrieved 30 January 2017. ^ Wang, Christine (30 January 2017). "Deutsche Bank to pay $425 million fine over Russian money-laundering scheme: New York regulator". CNBC. Retrieved 30 January 2017. ^ "Deutsche Bank Ends N.Y. Mirror-Trade Probe for $425 Million". Bloomberg L.P. 30 January 2017. Retrieved 30 January 2017. ^ Smith, Allan (8 December 2017). "Trump's long and winding history with Deutsche Bank could now be at the center of Robert Mueller's investigation". Business Insider. Retrieved 29 January 2018. ^ "A Mar-a-Lago Weekend and an Act of God: Trump's History With Deutsche Bank". The New York Times. 18 March 2019. Retrieved 19 March 2019. ^ Flitter, Emily; Enrich, David (15 April 2019). "Deutsche Bank Is Subpoenaed for Trump Records by House Democrats". The New York Times. Retrieved 16 April 2019. ^ Karoun Demirjian (15 April 2019). "House Democrats subpoena Deutsche Bank, other financial institutions tied to Trump". WashingtonPost.com. Retrieved 16 April 2019. ^ "Update: Criminal cartel charges to be laid against Deutsche Bank". ACCC. 1 June 2018. Retrieved 1 June 2018. ^ Jensen, Teis; Gronholt-Pedersen, Jacob (19 November 2018). "Danske whistleblower says big European bank handled $150 billion in..." Reuters. Archived from the original on 17 December 2018. Retrieved 20 November 2018. ^ Arons, Steven; Barnert, Jan-Patrick; Comfort, Nicholas (20 November 2018). "Deutsche Bank Hits Record Low on New Worry Over Danske Role". www.bloomberg.com. Archived from the original on 29 November 2018. Retrieved 20 November 2018. ^ "SEC.gov | Deutsche Bank to Pay Nearly $75 Million for Improper Handling of ADRs". www.sec.gov. Retrieved 8 March 2019. ^ "Deutsche to pay $75 million to settle ADRs abuses case, U.S. SEC says". Reuters. 20 July 2018. Retrieved 8 March 2019. ^ "Acquisition of Bankers Trust Successfully Closed". Deutsche-bank.de. Retrieved 17 August 2011. ^ "Deutsche Asset & Wealth Management – Real Estate Investment Management". rreef.com. 16 January 2015. ^ "Deutsche Bank to acquire RREEF for $490 million". nreionline.com. Archived from the original on 27 August 2010. ^ "interstitials | Business solutions from". AllBusiness.com. Retrieved 17 August 2011. ^ "Acquisition of Chapel Funding". Deutsche-bank.de. 12 September 2006. Archived from the original on 19 July 2011. Retrieved 17 August 2011. ^ "Acquisition of MortgageIT Holdings". Deutsche-bank.de. 28 July 2011. Retrieved 17 August 2011. ^ "Deutsche Bank wins control of Postbank". Financial Times. London. ^ "Ted Virtue – MidOcean Partners LP". ZoomInfo. Bankers Trust was a historic American banking organization. The bank merged with Alex. Brown & Sons before being acquired by Deutsche Bank in 1999. The Dell Technologies Championship was a professional golf tournament on the PGA Tour in the northeast United States, held annually in late summer over the Labor Day weekend. The 2018 edition was the last time the event was staged as the FedEx Cup was reduced from four to three Playoff events in 2019. In July 2018, the PGA Tour announced that The Northern Trust, the first event of the FedEx Cup playoffs, will rotate between the New York/New Jersey and Boston areas in 2019 and 2020. The 2019 playing of The Northern Trust will be held August 6–11, 2019 at Liberty National Golf Club in Jersey City, New Jersey, and in 2020, The Northern Trust will see the PGA Tour's return to New England and TPC Boston. Deutsche Bank S.p.A. is an Italian bank based in Milan, Lombardy. It is a subsidiary of Deutsche Bank A.G.. The Deutsche Bank Building (formerly Bankers Trust Plaza) was a 39-story office skyscraper located at 130 Liberty Street in New York City, adjacent to the World Trade Center site. The building opened in 1974 and closed following the September 11 attacks, due to contamination that spread from the collapse of the South Tower. The structure existed from 1974 to 2007, and was designed by Shreve, Lamb & Harmon, which also designed the famous Empire State Building. The building was purchased by Deutsche Bank when it acquired Bankers Trust in 1998. It was part of the skyline of Lower Manhattan, and was demolished between 2007 and 2011. 5 World Trade Center will eventually replace the building, expanding the ground space on which the World Trade Center stands, as this land was not part of the original World Trade Center. Deutsche Bank Place is a 240-metre-high (790 ft) skyscraper in Sydney, New South Wales, Australia. It is located at 126 Phillip Street (corner of Hunter Street) in the north-eastern end of the central business district, across the road from Chifley Tower. Construction began in 2002 and was completed in 2005. The building's architect is Norman Foster of Foster and Partners. Deutsche Bank is the primary tenant, occupying 7 floors and owning the naming rights. Other tenants include, Allens, Investa Property Group and New Chambers. The Deutsche Bank Players Championship of Europe was an annual 72-hole stroke play professional golf tournament for men. It was played in Germany and was part of the European Tour schedule. The tournament was founded in 1992 as the Honda Open and acquired the tag of The Players Championship of Europe or TPC of Europe in 1995. It was always been played at Gut Kaden near Hamburg, initially also at Golf Club St. Leon-Rot. The prize fund in 2007 was €3.6 million, which put it in the top group of European Tour events outside the major championships and World Golf Championships, but not at the head of the list. The parallels between this tournament and the PGA Tour's Players Championship are not very strong. The European Players Championship was not the richest event on the European Tour and it was not played close to the Tour's headquarters. The Players Championship's closest parallel in Europe is perhaps the BMW PGA Championship, although that was originally the British PGA Championship, and thus equivalent to the PGA Championship, organised by the PGA of America, which is a major championship and is now a European Tour event. Before it was attached to the event in Germany, the TPC/Players Championship tag was applied briefly to European Tour events in England and Portugal. It was more of a marketing tool than a genuine indication that the event is different from other leading European Tour events in any important way. Tiger Woods has played in the tournament several times. He was said to have received large appearance fees, which give rise to some controversy as appearance fees are not normally paid by European Tour events which actually take place in Europe. They are more common in less prestigious tournaments. The tournament was dropped from the 2008 European Tour schedule. Postbank – eine Niederlassung der DB Privat- und Firmenkundenbank AG is a German retail bank, which was formed from the demerger of the postal savings division of Deutsche Bundespost in 1990. Since May 2018, it operates as a brand of Deutsche Bank's retail arm. It serves 13 million customers in around 1,000 branches and 700 advisory centers. The Skyliners Frankfurt, currently known as Fraport Skyliners for sponsorship reasons, are a professional basketball club based in Frankfurt, Germany. Their home arena is Ballsporthalle. The club has played in the Basketball Bundesliga since 1999. Its greatest accomplishments were the German Cup competition title in 2000, the German national championship in 2004 and the FIBA Europe Cup in 2016. Its most famous player has been Pascal Roller, who was selected as Basketball Bundesliga All-Star seven times and played 122 games for the German national basketball team. Roller played ten seasons for the Frankfurt Skyliners until his retirement in 2011. Besides Roller, numerous other players of the German national team played multiple seasons for the Skyliners. A notable non-German basketball player is Mario Kasun, who played for the Skyliners when he was discovered and eventually drafted by the NBA team Orlando Magic in 2002. The Time Warner Center is a mixed-use building complex in Columbus Circle, Manhattan, New York City. It was developed by The Related Companies and AREA Property Partners, and designed by David Childs and Mustafa Kemal Abadan of Skidmore, Owings & Merrill.The Time Warner Center consists of two 750 foot (230 m) twin towers bridged by a multi-story atrium containing upscale retail shops. The complex also contains office and residential tenants. Construction began in November 2000, following the demolition of the New York Coliseum, and a topping-out ceremony was held on February 27, 2003. The property had the highest-listed market value in New York City, $1.1 billion, in 2006.Originally constructed as the AOL Time Warner Center, the building encircles the western side of Columbus Circle and straddles the border between Midtown and the Upper West Side. The total floor area of 2.8 million square feet (260,000 m2) is occupied by office space, including the offices of WarnerMedia (formerly Time Warner) and an R&D center for VMware; residential condominiums; and the Mandarin Oriental, New York hotel. The Shops at Columbus Circle is an upscale shopping mall located in a curving arcade at the base of the building, with a large Whole Foods Market grocery store on the lower level. Deutsche Bank will replace WarnerMedia as the anchor tenant of the 1,100,000-square-foot (100,000 m2) office area beginning in 2021, at which time it will be renamed the Deutsche Bank Center.